(June 7, 2018) – On June 7th, Aspire hosted seven team members from partner Flowers for Dreams at Metropolis Coffee Company for a volunteer workshop and tour of the Aspire CoffeeWorks facilities. 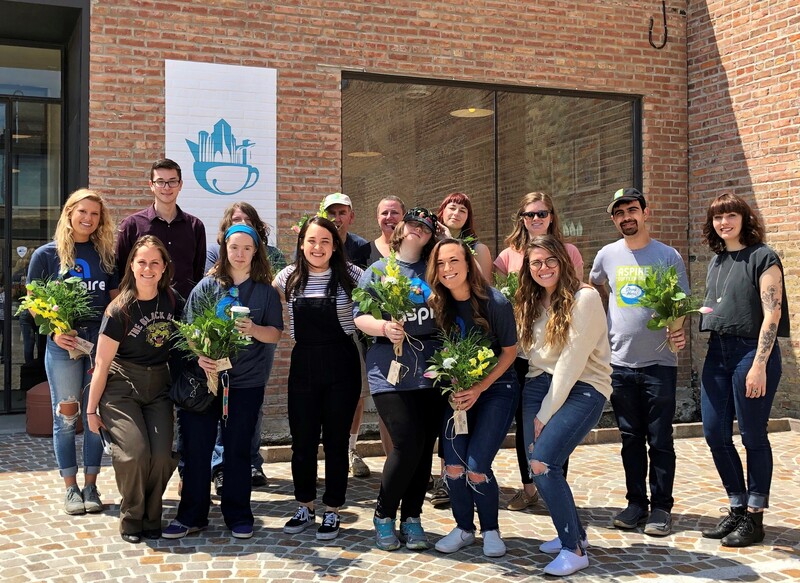 Aspire team members and Aspire Careers participants gathered for a floral arrangement workshop led by the Flowers for Dreams team. Participants practiced the art of floral design and created their very own mini flower bouquets! The group then toured the Metropolis roastery and watched the Aspire CoffeeWorks team in action as they prepared that day’s coffee order. It was a fun-filled, inclusive day celebrated in true Together, We’re Better fashion to kick off Aspire’s month-long partnership with Flowers for Dreams. A huge thank you to the Flowers for Dreams team for showcasing their amazing design skills and introducing us to the art of floral arrangements! Flowers for Dreams is a Chicago-based florist that sells high-quality, locally-sourced bouquets for just $35. They select 12 charities to partner with each year, and 25% of their profit each month goes towards the respective featured charity. Aspire is honored to be their featured charity for the month of June. Every bouquet ordered in June benefits Aspire and our mission of inclusion, breaking barriers for the 1,000 kids and adults with disabilities at Aspire. Visit their website and social media channels to learn more and place your flower order! For a full look at all the day’s festivities, be sure to view our Facebook album here.